The good thing about modern weather observation satellite technology and around-the-clock weathercasting is non-stop information about big storms. That’s also the bad thing. Hurricane Sandy has become the disasteur de juer for every 2-bit with a bad sports coat and a microphone and a dozen wannabe Weather Channel meteorologists in windbreakers. I couldn’t take it any more. Hubby took a nap. I thawed out some chick and pulled out one of my mother’s best slow cooker recipes. This is essentially a slow-cooker recipe. I wanted to make “a big mess”, so I needed to use the oven and adapted the recipe accordingly. I’ll give you the modified and original versions. Spray a large roasting pan with nonstick cooking spray. Lay the leg quarters in the bottom of the pan. Sprinkle with salt, pepper and the rosemary needles. Open the mushroom cans and pour the juice from the mushrooms into the pan, being careful not to rinse off the seasonings from the chicken. Pour the wine into the pan the same way. Did I mention LARGE pan? Cover the pan with heavy aluminum foil so that it’s steam-tight, and the top is sunk down…you want the vapors to condense back onto the chicken. Put the pan into the oven and turn it on to 275 F. Roast for 5 hours. Remove from the oven. Take out the chicken and set it aside to cool just enough to handle for deboning. Discard the skin and bones. Strain the stock and separate off the fat. Set aside 2 cups. Thicken the remainder with 1/2 cup flour. Return the chicken and mushrooms to the thickened stock. Simmer for 15-20 minutes. Meanwhile, cook rice or quinoa in the 2 cups stock to serve with the chicken. Use 1 whole cut-up chicken. Cut the amount of wine in half and use only one can of mushrooms. Cook on low for 10 hours or high for 6 hours. 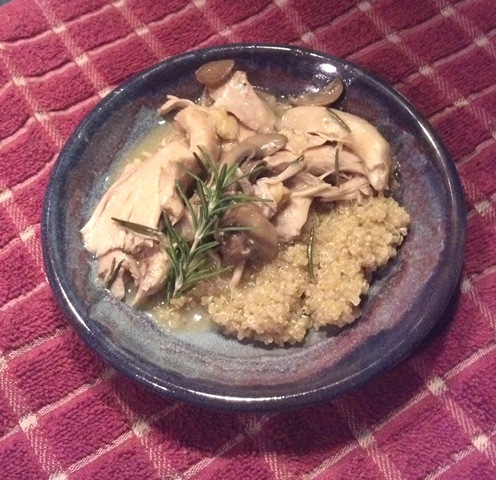 The original, 1970s version of this recipe called for Sauterne cooking wine, which is salted. If you use this, just eliminate the salt from the recipe and use a whole bottle of Sauterne.